Not many people have seen him since his glory days as a Tennessee walking horse. 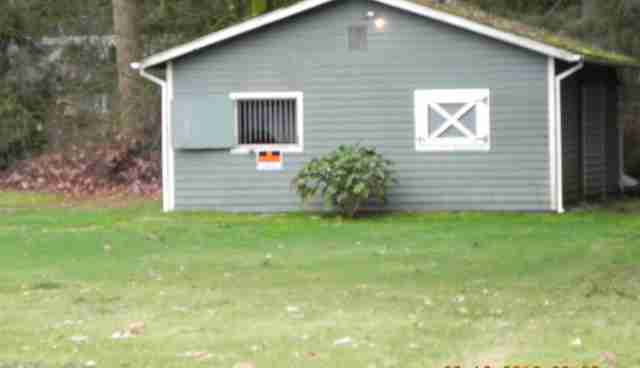 Today, See My Magic lives in a small stall on a picturesque property in Roy, Washington. He's still wearing his plastic "walking" shoes - they're kind of like high heels attached to the hooves, giving these horses their unique, albeit exaggerated, gait. Magic has likely been wearing his unwieldy rubber and plastic shoes for years. Tennessee walking horses are accustomed to the pageantry of equestrian events - but many, for all the flash and show, don't always have the happiest of home lives. Yes, they can be showstoppers. The thing is, the show stopped long ago for 13-year-old Magic. 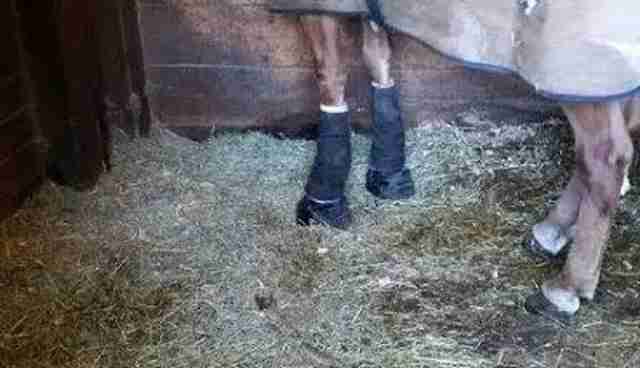 "We suspect the horse has been in the stall for more than three years and possibly even four years without ever having been let outside," animal activist Nicki Callahan, who lives about 50 miles away in Seattle, tells The Dodo. In fact, when photojournalist Karen Ducey visited the farm recently, the owner told her Magic hadn't been outside in years. 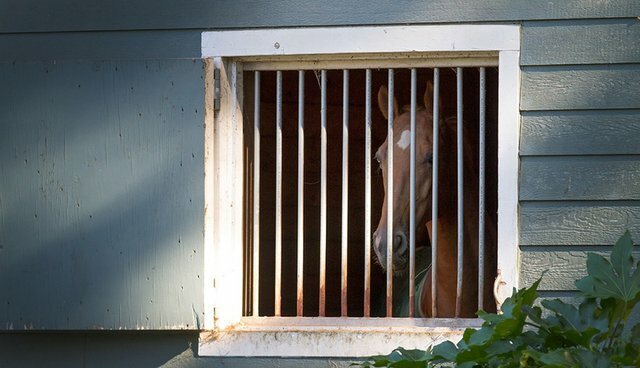 The situation isn't lost on the neighbors in this equestrian community. Several of them have spoken with Callahan. Many of them own horses who frolic in long paddocks or open pastures. "Most of these people are aware of the situation," Callahan says. "They've offered to let Magic go into their paddock, to go into their pasture." The owner, she says, has declined those offers. When Callahan went to visit the owner a couple of weeks ago "just to see how I could work with him," she was threatened with a call to police. Animal control officers have visited several times, once as recently as last Saturday for more than two hours. "Nothing's going on," Brian Boman, supervisor at Pierce County Animal Control, tells The Dodo. "There's no crime that's been committed, I can tell you that. There's no code that requires the horse to be removed from his stall." Indeed, Boman says Magic is in "outstanding" physical condition. No laws in Washington state have been broken. But that hasn't stopped a campaign to buy Magic from gaining momentum. An online petition has garnered more than 9,000 signatures. 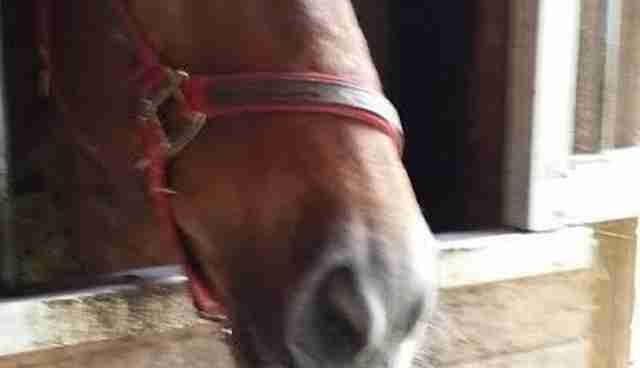 A GoFundMe effort has raised more than $3,000 in an effort to buy the horse. The group has already offered to purchase Magic for $6,000 - an offer, they say that's been declined. If Magic is to step out of his stall again, they will need more. The owner, Callahan says, has asked for $20,000. "We have to prove that it's unjustifiable or unnecessary physical pain," Boman says. "There's no way possible that we could prove that with this animal." For now, Boman thinks his officers have better things to do than chase complaints about a well-fed horse who just happens to never set foot outside. "I'm getting pretty fed up and tired of it because it's wasting our time when we actually have other cruelty cases that we need to deal with," he says. "This is taking too much time from my officers." What do you think? 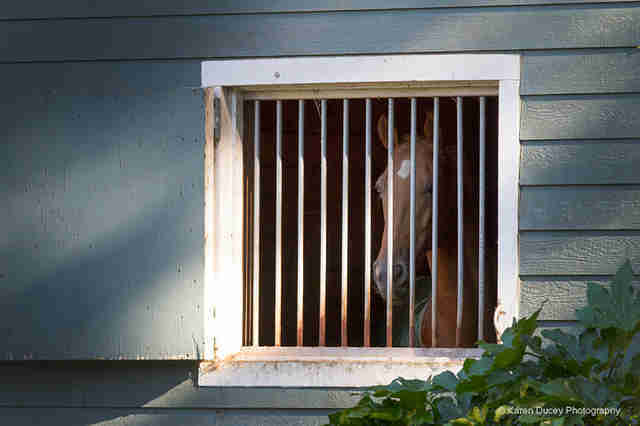 Does Magic deserve to step outside of his stall? Lend your voice to the petition. If you would like to read more about Magic and see more pictures of his situation, check out Karen Ducey's firsthand account in Animal News Northwest.